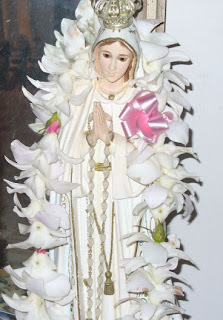 Please Pray for the Protection of Life! I will not be on the computer tomorrow. But I did want to ask you to pray. As you know the President's health care reform bill may have the votes needed to pass (if you believe Washington and the MSM) so please pray, pray and pray that life be protected. 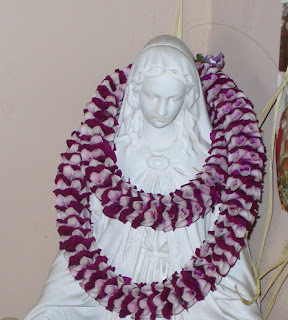 I would suggest Blessed Mother's express Novena Nine Memorare prayers in a row for this intention. Father Romeo gave an interesting homily tonight based on the Gospel reading. 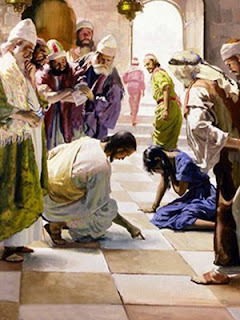 When the Pharisees and the scribes brought the adulterous women to His attention, Jesus was on the ground writing in the dirt. Father illustrated the following point to us. He said that when we do not like or are not interested in what we are hearing, we do not pay attention; we busy ourselves with other things. This is what Jesus did by bending over and writing on the ground with His fingers. He did not like what the Pharisees and the scribes were up to. I thought it was interesting that the main question of that Gospel passage according to Father Romeo was not WHAT was Jesus writing but instead WHY was Jesus writing on the ground in front of the Pharisees and scribes. Father went on to say that when we gossip about our neighbors, God will not listen to our prayers. Prayers like those are not heard by God. Just like Jesus would not listen to the Pharisees and scribes. Another point Father made was the fact that Jesus referred to the woman caught in adultery as "Woman". Father reminded us that Jesus only called one other woman "Woman" and that was His own mother. Father said that Jesus was giving dignity to that woman by referring to her as "Woman". Keep in mind that Father's homily was more eloquent. I will break down a prejudice that I still harbor in my heart against some aspect of Christ’s message. When my son was a little boy, around the time the movie Titanic was in the theaters, his father took him to an awards banquet. The entertainment that night was a woman singing "My Heart Will Go On" from the movie Titanic. 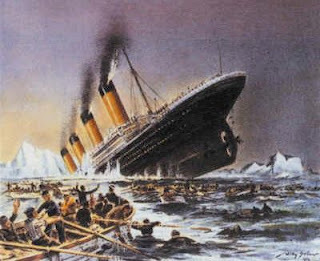 My then young son turned to my husband and said loudly "I don't like the singing, I like the sinking!" If that name of that religious order sounds familiar, it should. Some of the sisters recently appeared on the Oprah show. I want to take this opportunity to thank you for your efforts in promoting the “Truth in the Heart” series on EWTN as well as references to the appearance of the Dominican Sisters of Mary, Mother of the Eucharist on the Oprah Show. You may be interested in knowing that the responses we have received following the show have been overwhelmingly positive. Many have mentioned that the young Sisters answered the questions directly and without hesitation while exuding sincerity, wide smiles, and a joyful countenance. Others have pointed to Lisa Ling’s positive response following her experience with the Sisters at the Motherhouse in Michigan. Many have commented on how respectful Oprah was throughout the interview. Mindful of the potential for a negative spin once the show was taped and edited, we believed that it was worth the attempt to reach out to an audience we might not otherwise be able to reach. We hoped to touch the hearts of the viewers and be a vehicle for sharing the Gospel while demonstrating our devotion to Christ. We are very grateful that God has blessed our effort and renewed our enthusiasm to reach out to the world and spread the light of the truth to all who will listen. If anything, the responses have demonstrated not only that there will always be a need to educate the world about Christ, but also how hungry the world is to receive it! 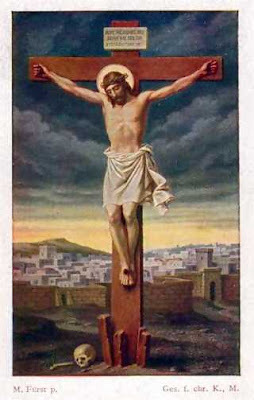 During this Lenten season, we are reminded that our true hope is in Christ, Who conquered death, sin, and sorrow. May you experience the overflowing joy of the Resurrection! 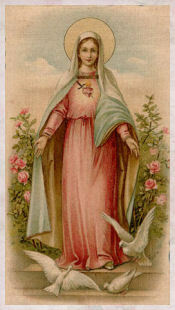 Please pray for us and be assured of our prayers for you. So, What Age Was St. Joseph? The Russian Orthodox tradition according to my friend Mimi, is that St. Joseph was an old man when Jesus was born. 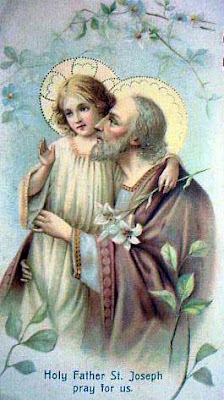 I am not exactly sure the Roman Catholic tradition is as St. Joseph is depicted both as young and old in Catholic art. 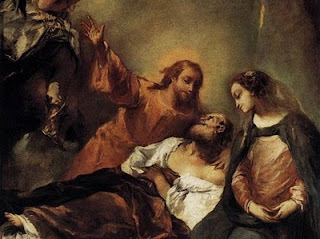 There is an interesting article over at The Pious Sodality of Church Ladies discussing the issue of St. Joseph's age. 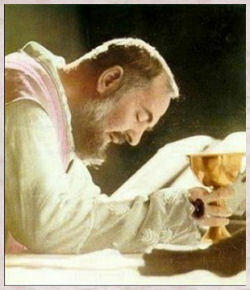 ..."Padre Pio reportedly insisted the St. Joseph was even younger - perhaps only 18 when espoused to Our Lady..."
I hate to post this especially on St. Joseph's feast day. But this will give us more of an incentive to pray to protect the U.S. from the president's health care reform. This is Speaker of the House actually saying we should pray to St. Joseph the Worker today his feast day, to pass this evil health care reform. Really! 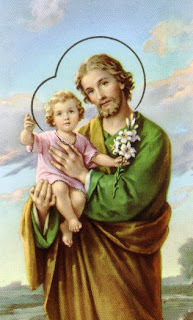 BTW, it is not the feast day of St. Joseph the Worker the Catholic Church is celebrating, which is May 1st, but St. Joseph the Husband of Mary. Just an example on how much this "Catholic" politician knows her faith. Another example is a story we shared yesterday found here where a small group of sisters/nuns are opposing the bishops with regard to passing the health care reform. Let us instead pray that God protect the unborn and the vulnerable and that the pro-life politicians will take a strong stance for life. Today is one year since God called my good friend Father Duffy, home. 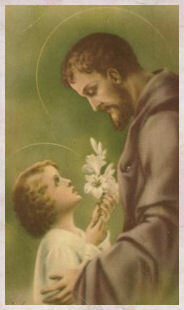 He was called home on St. Joseph's Feast Day. How fitting! Because of my father's passing, I was not able to attend his funeral. I heard there were many priests in attendance that day. I know the homeschoolers were there. 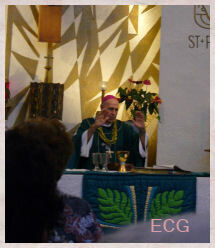 He had been our devoted spiritual director for many years. 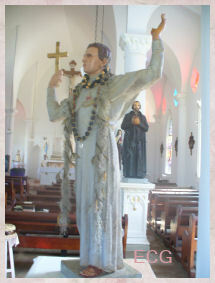 I cannot pass by his street or think of his beloved St. Pius X Church without thinking of him. 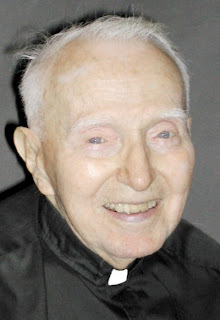 He was a wonderful and holy priest with a devilish sense of humor and a twinkle in his blue eyes. He was one of a kind. If God willing, he is in Heaven right now, I just know is telling his old jokes. 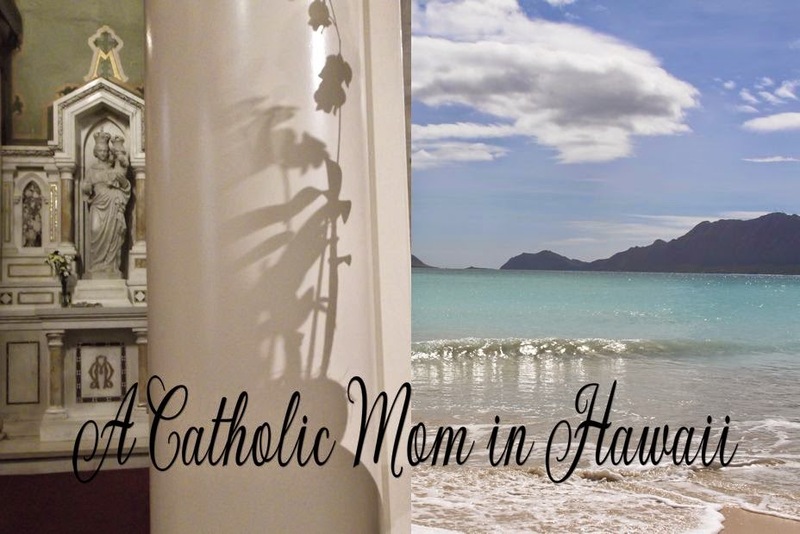 I found his obituary that appeared in the Hawaii Catholic Herald. It was the first time I had read it. Patrick Downes, the editor, did a great job. I hope you take the time to read about this beloved priest. A blessed feast of St. Joseph on March 19! 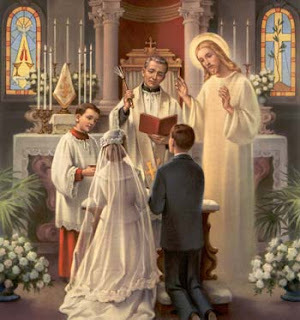 This is a solemnity, a feast of the highest rank, to honor the husband of Mary and the guardian of our Redeemer. In addition to being the Patron of the Universal Church and of several countries, he is the second principal patron of the Society of Mary (Marianists), my religious family. More in the attached article. Notice the beautiful stained glass windows in the bathroom. Something very sacrilegious about the whole thing. 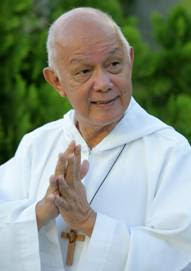 Father Richard Ho Lung of the Missionaries of the Poor explains how to “live the Mass” amidst the activities of daily life in the one-hour show “Living the Mass” at 10 p.m. 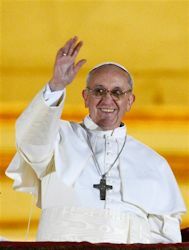 ET, Wed., March 17, exclusively on EWTN. by Brother John M. Samaha, S.M.. Used with permission. What do we really know about St. Patrick? His background is shrouded in mystery. What we have heard often mingles myth with reality. To separate fact from fiction we need a closer look. We need to ask the real St. Patrick to please stand up. In the fifth century A.D. an adolescent boy in Britain was kidnapped and enslaved by marauders from a nearby country. The youngster they captured eventually eluded his captors in Ireland, but several years later returned as a priest with the conviction that God had chosen him to convert that country to Christianity. That young Briton named Patricius died an Irishman named Patrick. Ireland and Christianity have not been the same since. Meet the authentic St. Patrick. His life was clouded by legend, but peeling away the myth we discover that what is factually known about St. Patrick is far more interesting. He never chased the snakes out of Ireland, nor do we have any certainty that he used the shamrock to teach the Trinity to his converts. History possesses no written records about Britain or Ireland from the fifth century except those few about Patrick. Quite simply Ireland had no written records prior to Patrick. The sequence of his life is not clear, and historians cannot identify when he was born, ordained a bishop, or died. But scholars agree that the two extant examples of his writing are clearly the work of the same man we today call Patrick. 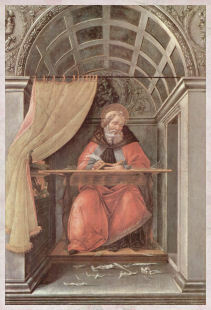 The two brief compositions of Patrick, his Confession and his Letter to Coroticus, are the sources of all we know for certain about the historical Patrick. The Confession, not really a biography, recounts his call to convert the Irish and aims to justify his mission to an unsympathetic people in Britain. The Letter to Coroticus, an Irish warlord whom Patrick excommunicated, illustrates his power as a preacher, but yields little biographical information. In a nutshell these are the biographical facts. Patrick was born Patricius in Roman Britain to a Christian family of some wealth. He was not religious in his youth, and claims he was close to renouncing his family’s faith. Kidnapped and taken to Ireland as a slave for a warlord, he worked as a shepherd for six years and then escaped. At home he began studies for the priesthood with the intent to return as a missionary to his former captors. Clearly he had committed his life to Ireland until death. 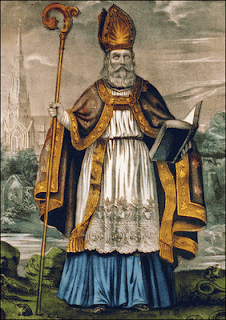 By the time he had written the Confession, Patrick was recognized as bishop of Ireland by both the natives of Ireland and by Church authorities on the continent. Two traits are patently evident in Patrick’s Confession: his humility and his strength. These characteristics are missing in early biographies and in the legends. The missionary Patrick who returned to Ireland was a strong and vigorous personality. He was tough and determined. 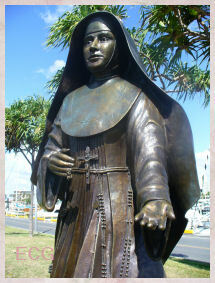 He had to be to pursue the vision that launched him in the evangelization of the pagan island. He was not the least bit reluctant to undertake this mission despite the fact that in 400 years no one had taken the Gospel beyond the bounds of Roman civilization. As each obstacle was encountered, Patrick mustered the strength to overcome it. With limited education -- he was chiefly self-educated -- but with the grace of the experience of his enslaved exile, Patrick determined to do what no other had done in the previous four centuries of Christian history. He decided to bring the Gospel to the ends of the earth, and he planned wisely a way to do it. Unaided he figured out how to carry Christian values to the barbarians who practiced human sacrifice, who constantly warred with each other, and who were noted slave traders. That was neither simple nor easy to attempt. Most likely he hazarded this challenge of evangelization never before undertaken by the missionaries of the Greco-Roman world because the Christians of the continent did not consider barbarians to be human. Patrick’s years as a slave had uniquely molded his attitude to mount a heroic effort to reach the minds and hearts of these untamed people. Patrick detested slavery, and may have been the first Christian leader to speak out unequivocally against it. The Church did not formally condemn slavery as immoral until the late nineteenth century. Patrick had experienced this suffering, knew how to suffer with others, and understood the sufferings of others. Compassion was his strong suit. A more genuine advocate for the disadvantaged and the marginated of society than Patrick would be difficult to find. 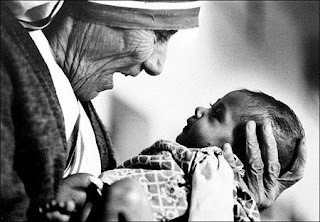 Without doubt he is one of the great saints of the downtrodden and excluded whom others shun. In Patrick women too find an advocate. He speaks of them as individual human beings, lauds their strength and courage in the sufferings they endured in slavery, and respects them as handmaids of the Lord. 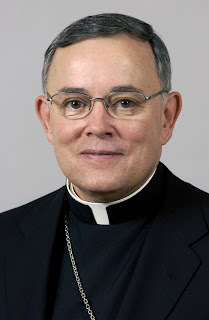 Unlike most of his episcopal contemporaries, he might be the first male Christian since Jesus to speak so positively about women. Patrick was convinced he had a God-given mission, and that Providence would see him through thick and thin. This gave him the will to return to the barbarians who had mistreated him. 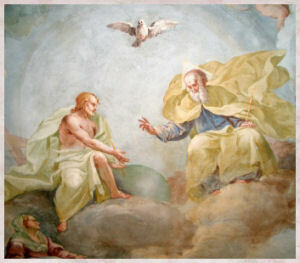 Patrick saw God at work in the world as a loving and benevolent Father. Did Patrick accomplish his mission? At the time of his death human sacrifice had ceased, the Irish people abandoned the slave trade, and, although they had not stopped warring with each other, the battles were more restrained. Patrick knew these people would not change overnight. This is the legacy left by St. Patrick: he had met the objective set by Christ, the Master of Apostles, to spread the Gospel to the ends of the earth. And his successors continued the pursuit of that objective. As Ireland without Patrick is unthinkable, so too is life today without the saints. The saints are for the ages, ours no less than others. Without saints life would be miserable. The saints are for everyone -- believing and unbelieving -- because they are the people who proclaim by their lives that life is valuable, life is worth living, that a provident God cares for us. Without them life would be a series of disasters. St. Patrick personified this Christian hope. 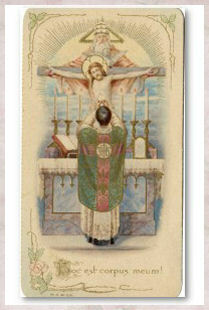 show yourself today the advocate and protector of priests. and the hardships of your exile. chastity in tenderness, and hope in uncertainty. and the healer of those wounded in spiritual combat. where harm has been done, do good. and peace for all under your gracious protection. I want to thank Breadgirl for sharing this beautiful Irish melody on her blog. She posted it for Mothering Sunday but I thought it appropriate to share it on St. Patrick's Day. Very touching. One of my sisters shared the following with me. I think this is great! Dr. Anthony Esolen was recently a guest on EWTN's Life on the Rock. He is a good speaker. He has his Ph.D. in Renaissance English Literature. The following are some points for young people to consider in a person before marrying them. He states that some of the points were meant to be facetious. But the gist of the points is quite good. 1. Don't marry a woman who likes cats but does not like dogs. You may marry a woman who doesn't like either, or whose reason for not liking dogs is that one of them bit her when she was a toddler. But a woman who likes cats but does not like dogs will be a Joan Crawford or Jane Wyman. Ronald Reagan married Jane Wyman, and look how sorry he was about that. 3. Don't marry anybody, man or woman, who says, "I'm going to call you at eight," and then leaves you waiting by the phone for an hour. Exceptions can be made for people who are kidnapped by Arabs, or who have epileptic seizures. 4. Don't marry anybody who insists on a separate bank account, bed, bathroom, vacation, or zip code. It makes no sense to be one flesh and two wallets. ..."I need grace to be pure. The will to be pure is necessary as well, but it is not enough. I must understand that or I shall not be chaste. And I must pray for that grace daily." From Rosary meditations on Joyful Mysteries on Purity. Father Peyton's Rosary Prayer Book. I may have mentioned that when we were kids, it was forbidden to do anything on Good Friday, EXCEPT to watch the latest episode of Dark Shadows. My mom still cringes at her ignorance on observing the most solemn day of the liturgical year. All of us have done similar things like this during Lent or Holy Week. 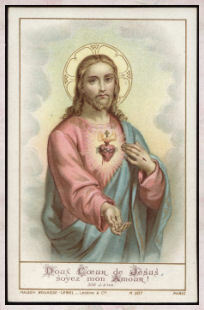 But the good news is, even though we are weak and fall short of our Lenten resolutions, it may not necessarily be a sin. Also, there is a debate on whether or not to take a break of our Lenten fast on Sundays during Lent. These Sundays are referred to as "little Easters". One friend believes that Jesus fasted in the desert for 40 days straight so why shouldn't we? Yet Every Sunday is a celebration of the Day of the Lord's Resurrection. and the Church celebrates on these days. I do not think there is a right or wrong here as long as one is doing it for the right reasons, to grow closer to Christ during His Passion, and of course, not to judge his or her neighbor if they do the opposite. And, another popular form of fasting this Lent is fasting from Facebook. See article here. I am one of those individuals who have chosen to fast from Facebook this Lent. I must tell you, I have never felt so free. This shows me that Facebook was becoming too addictive for me. At first it was tempting to log on to see what was going on in the world of my "friends". Yet, other than to accept friend invites, and to send direct messages that I deemed absolutely necessary, I really do not miss being on Facebook. 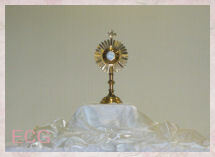 I have more time to do more spiritual reading, works of mercy, make stuff that takes lots of time like making jam, etc. I know it was the right thing for me to do. On the other hand, Catholic blogger, Fr. Daren did not give up Facebook for Lent. You can read his reasons by clicking on his name. Again, there is not a question on what is the right thing or the wrong thing to do. It is what is right for the individual. Fr. Daren makes a good point on why he continued to be on Facebook. 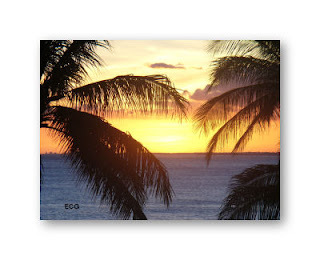 BTW, a big mahalo to Deacon Greg for both links.